*Pure Inventions all-natural health and wellness drops were designed to deliver improved hydration and immune support, without the use of sugar, caffeine, artificial sweeteners, or artificial ingredients. 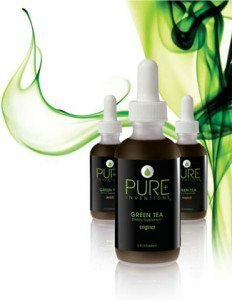 Start experiencing the benefits of Pure Inventions Speciality Solutions, Antioxidant Super Fruits, and Green Tea Extracts today! Contact Rock Creek Wellness at 913-727-7700 today to start experiencing the benefits of ultra-pure healthy hydration! Night Time – d*esigned to promote relaxation and support restful sleep. With valerian root extract, lavender oil, chamomile flower extract, and melatonin. Hair + Skin + Nails – *designed to support and maintain healthy hair, skin, and nails. With vitamin C, biotin, horsetail extract, and L-cysteine. Fit & Slender – *May be used as a weight-management formula. Aids in the breakdown of fatty acids and helps metabolize carbohydrates. Tranquility – *Inner peace … now available in liquid form. May be used as a rest and relax formula. Healthy Liver – *Live longer! May be used as a detox blend for the liver, and for skin and immune support. D3 – *Hello sunshine! D3 formula may be used to improve bone structure and for immune support. Naturally sweetened with Lo Han fruit and Stevia leaf. Pomegranate Acai – *provides support for a healthy metabolism and healthy immune system. Cranberry Elderberry – *May be used to improve immune system, urinary tract, and kidney health. Elderberry is known to have antioxidants that help boost the immune system. Wild Cherry Apple Resveratrol – *the clock stops here! Enjoy the sweet taste of cherries in a formula that may be used to improve the immune system and to promote anti-aging and overall wellness. Blueberry White Tea – *Enjoy a boost of blueberry flavor with this formula designed to help improve brain function.